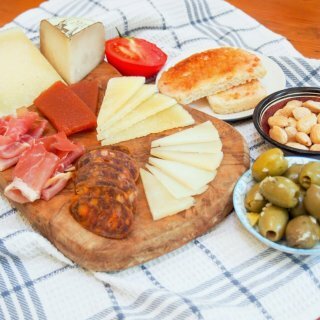 A Spanish cheese plate, with or without cured meats as well, is a great way to start a meal or for a light lunch. Thinly slice the cheese and meats, if not already sliced. Arrange the slices around a plate, with the almonds, bread, olives and membrillo on the side. Adjust quantities to the number of people/course you are serving.